Notes: 1. Flora Finch was a well-known screen comedienne and earlier had made many Vitagraph comedies with the late John Bunny. 2. "Panthus" was described as "the ugliest pup in the world" in an article in The Moving Picture World October 7, 1916. 3. The name of the character "Astorbilt" is a fanciful combination of Astor and Vanderbilt, two of America's wealthiest families at the time. "Astorbilt" was not original with this film, as the term had been used elsewhere to designate a typical society person of great wealth. Astorbilt was also the name of a character in the October 18, 1915 Falstaff film, Busted But Benevolent. Related constructions had been used earlier in films; e.g., the title character in the February 3, 1913 Champion release of The Rich Mr. Rockamorgan, a combination of Rockefeller and Morgan; and Mr. Rockabilt, a character in The Electric Bathtub, a March 4, 1910 Pantograph release. 4. A scene from Prudence the Pirate appeared on the cover of The Moving Picture World, October 21, 1916. 5. Some notices punctuated the title as Prudence, the Pirate. "A play that charms - that takes you back to the rare old days when the heart was young and life a big adventure." "Miss Hulette's search for the world's ugliest pup seems likely to be successful. The star wants the dog for use in Prudence the Pirate and is asking for uncomely canines to apply by photograph only. She already has received 100 pictures of dreadful-looking animals, all said to be dogs, but many looking like muskrats. The winner will have an opportunity to take beauty treatment, for a manufacturer of dog biscuits has offered to take the pup and feed him for a month, guaranteeing to making him handsome in the process." "Gladys Hulette, one of the youngest favorites of the screen is earning the salary of a bank president at the age of eighteen. She has her own home and her own automobile paid for by her own money. This might lead to the conclusion that she is a spoiled child, but she isn't. Miss Hulette made her debut at the age of three. She has been before the public on stage and screen ever since. When one of her recent pictures, The Shine Girl, was shown in Boston, Miss Hulette appeared personally and the multitude on Washington Street who wanted to see her held up the traffic. Now she is climbing up the ladder to further fame. Her latest picture is Prudence the Pirate, a delightful play of youth, romantic adventure and love, in which Panthus, the ugliest pup in the world, appears in an important part, and in which Prudence's dimpled knees are seen above the tops of her seaman's boots. "Prudence the Pirate was written by Agnes C. Johnston, and produced under the direction of William Parke. Miss Hulette was glad when Prudence was finished and she could get back into everyday clothing. In the picture she wears overalls, a pirate costume and a bathing suit, and takes a turn at acting as butler, in the latter's uniform. However, she never was as troubled over her quaint costumes as was Panthus, who owes his name to the fact that 'he pants so much.' Panthus never could figure out the need for all these changes, and was constantly bewildered at what he considered the utterly foolish things his mistress did. Before the picture was finished, he was worth thousands of dollars. If he had run away every scene in which he appeared would have had to be taken over again. How did Miss Hulette come to make her early debut? A tiny part in a tiny play required her to run across the stage. She was so winsome that the audiences applauded. Little Miss Hulette liked that applause. It helped her to decide to make the stage her profession." "The law of compensation has been making itself felt upon Gladys Hulette. For the last few weeks, Miss Hulette has been envied by the other Thanhouser players because she has been spending a few days out in the cool breezes of Long Island Sound on a ship taking scenes for Prudence the Pirate. But old Mother Nature insisted upon balancing the scales. All last week Miss Hulette suffered in smoke and flames. She was in the studio making interior fire scenes for the same picture." 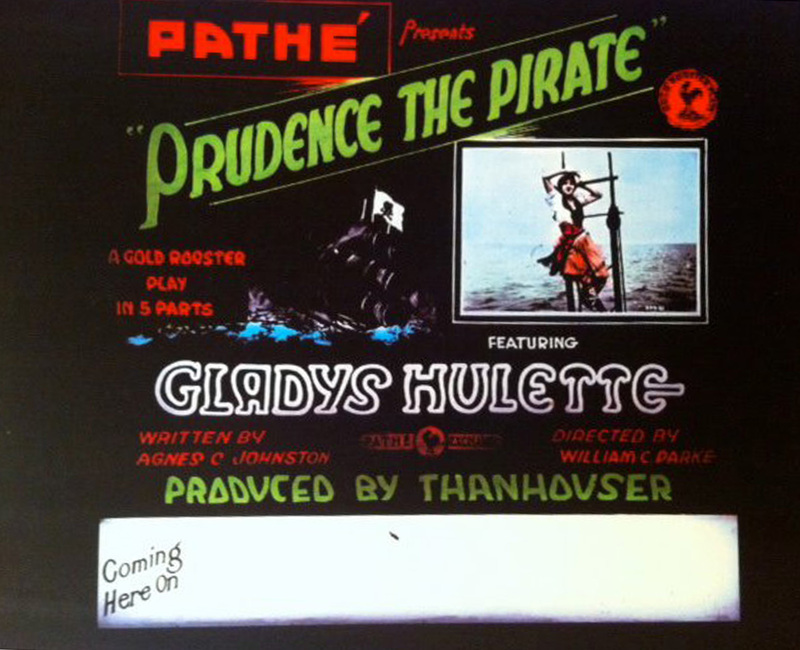 "Prudence the Pirate, starring Gladys Hulette, will be the second Thanhouser feature through the Pathé Exchanges in October. October 22 is the date upon which Prudence will have her first public showing. Florence LaBadie in The Pillory is to be Thanhouser's first October release. The same staff that made The Shine Girl one of Thanhouser's greatest successes is responsible for Prudence the Pirate. The star is Gladys Hulette, the director William Parke, and the author, Agnes C. Johnston. The feature is a comedy drama about a little girl with piratical ambitions on the good ship Bucket of Blood and captures a houseboat. An exciting fire aboard the Bucket of Blood is one of the features. In the supporting cast is Flora Finch, famous for her long engagement with the late John Bunny. Others in the play are Riley Chamberlin, Barnett Parker, and William Parke, Jr."
"Prudence arrives from boarding school at the home of the aunt who intends to usher her into society. Prue balks at 'debuting' and the only warmth she extends to Astorbilt, the season's 'catch' and one of the house party guests, is in the form of some hot bouillon which she mischievously spills down his neck. The results convince Prue that the only one in the house with a sense of humor is Meeks, the butler, and a close relationship springs up between the two. He hints to her that he has been to sea and 'seen things,' and when pressed further confides that he was once a pirate! All Meeks ever saw of the sea was as a cabin boy on a missionary ship, but he spins wild yarns of adventure, and Prue, her romantic young nature fired, decides to become a bonny buccaneer. With much secrecy and aided by her entire summer's spending money a schooner is rented and christened the Bucket of Blood. A crew of tramps is recruited and all is complete save for a chaperone and a deck scrubber. Hoisting her black flag her aunt's houseboat is attacked. The old lady and Astorbilt are captured to fill those capacities. Astorbilt bribes the crew to mutiny and Prue finds herself a prisoner on her own ship. The rough and tumble life in the crisp salt air cracks Astorbilt's effeminate pink tea veneer and from beneath it the true manhood emerges. Gradually Prue finds her heart also becoming a captive to the changed individual. A fire breaks out and he rescues her at danger to himself. Plunging into the sea with his fair burden, he swims to a bell buoy to await the coming boat. There Prue, with her customary disregard for conventions, promises to lower the black flag and surrender her heart forever." "As a whole: entertaining; story: conventional; star: lacks vivacity; cast: adequate; settings: good; photography: clear. "In this Thanhouser photoplay we are given some fine touches of comedy, good direction and excellent screen acting. Flora Finch is cast in the role of Aunty, while Riley Chamberlin contributes a goodly portion of the fun as Meeks. Miss Hulette, beautiful and pleasing as ever, did not seem to get all the comedy out of the part assigned to her. The supporting cast is well chosen. Prudence should prove to be a good attraction and is well up to the Thanhouser standard. Prudence, just out of boarding school, returns to her aunt's home where she is to enter society. She objects decidedly, and after several escapades, particularly directed against one Astorbilt, the season's 'catch,' she finds a warm friend finally in the person of the family butler. Meeks confides to Prudence that he has been a sailor and 'seen things.' When pressed further concerning his seafaring life he confides that he was once a pirate. He tells of his adventures and Prudence, her romantic nature fired, decides to becomes a buccaneer. A schooner is rented and christened The Bucket of Blood, a motley crew of tramps are put aboard, and all is in readiness for a voyage except a chaperon and a deck scrubber. Prudence attacks her aunt's houseboat and kidnaps the old lady and Astorbilt to fill those capacities. Astorbilt, however, bribes the crew to mutiny, and Prudence finds herself in irons on her own ship. The rough and tumble life aboard The Bucket of Blood changes Astorbilt from a pink tea person to a man of steel and Prudence falls in love with him. Fire breaks out on the ship and Astorbilt swims with Prudence to a bell buoy and saves her life. There Prudence, with her customary disregard for convention, promises to lower the black flag and surrender her heart forever. It is a clever comedy, indeed." "One of the pleasantest little plays seen in some time is Prudence and the Pirate [sic], a picture which has been cleverly written, well directed and which gives Gladys Hulette an opportunity to prove again that she is one of the most refreshing young actresses on the screen. The story tells of Prudence, a lively young person, who hankers for the wild, roving life of a pirate. Of course, her aunt wants to turn her into a debutante, but Prudence rebels and actually succeeds in getting a pirate vessel and assembling a villainous crew. Her first act is to capture her aunt's houseboat, carry off her auntie to act as a chaperone, and run away with Astorbilt, a young millionaire, for a deck scrubber. With a prim aunt, a millionaire, a pretty young girl, an adoring young boy, a staid old butler and a whole crew of hoboes on board, the funny complications which enliven life on the Bucket of Blood can be imagined. In the end the millionaire proves to be not only a good sport but a good hero. When the ship catches on fire, he risks his life to rescue Prudence, who has been locked in a cabin. When the picture closes we find Prudence making up her mind to have orange blossoms and a veil, even though they are awful conventions. "Agnes C. Johnston has set about writing her story as though she had never seen a moving picture in her life and didn't know that by every screen convention the millionaire should have been the villain and Prue's young admirer, the hero. As it is, there is not a commonplace character or a hackneyed situation in the whole picture; the people are all human beings and the comedy is lively, good humored and original. As for the subtitles, many of them are good laughs in themselves. An exceptional cast makes the most of the characters, and William Parke's direction is entirely satisfactory. He has incorporated many humorous touches that are sure to be appreciated. The one and only Flora Finch is seen as Prue's aunt, and Riley Chamberlin does his inimitable character work as Meeks, the butler who inspires Prue with longings to follow the black flag. Barnett Parker deserves credit for resisting all temptations to overdo a part which might easily have been exaggerated. He makes Astorbilt a likable man. A funny little dog called Panthus, because he pants so much, is responsible for some of the comedy, and William Parke, Jr., is a good, small boy." "In Prudence the Pirate Gladys Hulette has a youthful role finally fitted to her tender years - surely as Prudence she looks not more than 16, and it is a more or less accepted fiction that a female is only as old as she looks. The story is by Agnes Johnston. It is a craftsmanlike piece of work, especially that part of it which is devoted to the draughting of the leaders. They have more than a distinct comedy flavor; there is always presence of literary touch. Miss Hulette is supported among others by Flora Finch and Riley Chamberlin. These two unusually clever character actors prove to be just the team that one knowing their individual capacity for mirthmaking would be led to expect. The general result is worthwhile. Prudence the Pirate will make good entertainment. Miss Hulette as Prudence shows marked skill in comedy interpretation. She has the pep and abandon of a young girl. Prudence is romantic, with a leaning to the piratical. She imposes her pranks on relatives and servants alike. Her misadventures have the natural effect of indefinitely postponing her formal debut in society even while her feminine ways are hastening the ensnaring of the smitten Astorbilt. "Miss Finch is seen as the prim aunt who unsuccessfully tries to keep her niece within the bounds of conventionality; but who likewise finds her matchmaking ambitions gratified when Prudence, in her own ways secures the hand-picked prize, Mr. Chamberlin's Meeks, the family butler. Meeks loses his standing as a temperance advocate on the invitation of Prudence. He looks on the punch when it is red; his position is placed in still greater jeopardy when the hastily gathered pirate crew of the Bucket of Blood kidnaps him and carries him away to don a pirate's scarf. Barnett Parker is Astorbilt; he does a good bit of character drawing of the wealthy young man none too strong in his masculinity. Yet he does not overdo the part. The remainder of the cast gives satisfactory support." "This five-reel subject has as its principals Gladys Hulette, Flora Finch, and Riley Chamberlin. It is an interesting comedy by Agnes Johnston and is well made." REVIEW, The New York Dramatic Mirror, October 14, 1916: This review is reprinted in the narrative section of the present work. "The first of this film is devoted to presenting Miss Hulette as a society madcap anxious for an adventure. After considerable film leading up to her inspiration, we found her chartering a schooner and manning it with a lot of funny-faced hoboes, who were dressed in pirate costumes, the expedition being commanded by the debutante and a neighbor youth who wanted to marry her. The 'pirate ship' bore down upon the houseboat in which the guests at the debutante's home were having a good time. A wealthy suitor for her hand, and her aunt were kidnapped, the aunt as chaperon, and the suitor in order that she might make him scrub the decks. "Barnett Parker had registered some good laughs in the Nance part of the wealthy society suitor, and the 'Flossy' mannerisms made a good contrast against the imitation pirate atmosphere. The first four reels of this were overdrawn comedy, with the funny types of the crew, the unusual situation, Flora Finch as the aunt, and Riley Chamberlin as a very funny lying butler providing frequent smiles and snickers. On the finish we got some melodrama when the 'pirate ship' was accidentally set on fire and the heroine was left locked in the cabin when the boats pulled away. The hero now redeemed himself by swimming back to the burning ship and rescuing Miss Hulette from the cabin, where flame torches had been working overtime in a rather poorly-managed studio fire scene. While this melodrama will never convince, it is at least interesting, and the early comedy stuff is good entertainment, despite the fact that it is so decidedly overdrawn and will surely not be accepted as a possibility. We had many close-ups of Miss Hulette, in some of which she registered as quite a beauty, and several of the human-interest scenes were quite well handled. There was nothing artistic about this production, but it is sufficiently different as to be a safe bet figured as entertainment. "The Box Office Angle: I believe that you can feel pretty safe in booking this because it is different. It is just a light comedy with a 'melo' climax, but the idea is different and I would say that any average audience would enjoy it. As to box-office value, there is a question as to whether or not Miss Hulette's name will pull, since she is rather a newcomer to the ranks of stardom. I would depend almost entirely upon playing up the unusual situation of a society debutante, who, in seeking an adventure, chartered a schooner and set out as a sure-enough pirate craft. That sounds very interesting, and on that alone you should be able to pull considerable business. Use Miss Hulette's picture generally, and ask the question: 'Can you imagine this young lady commanding an honest-to-goodness pirate crew? She did it! That was her idea of a good time. See Prudence, the Pirate.'"